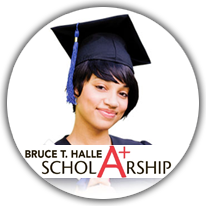 The Bruce T. Halle Scholarship Program is available to college-age dependents, ages 17-24, of all full-time employees who have worked at the company for three consecutive years. The scholarship is provided for undergraduate study only, and students must be enrolled full-time and successfully complete 12 credit hours each semester. The scholarship award is valued at $5,000 per year for students attending a four-year university, or $2,000 per year for students attending a two-year community college or vocational school. The scholarship is divided in two payments and will be paid directly to the school. The deadline for new applicants is March 15. The deadline for renewing students is April 15. The dependent child of a full-time employee with at least three consecutive years of service with Discount Tire Company, America’s Tire Company or Discount Tire Direct, by application deadline. A high school senior graduating from an accredited high school OR a student already attending an accredited post-secondary institution or vocational program. An active participant in school and community service activities. Academically motivated as determined by a school transcript, recommendation and application materials. If you have any questions, please contact the Halle Foundation office at 480.515.7500.